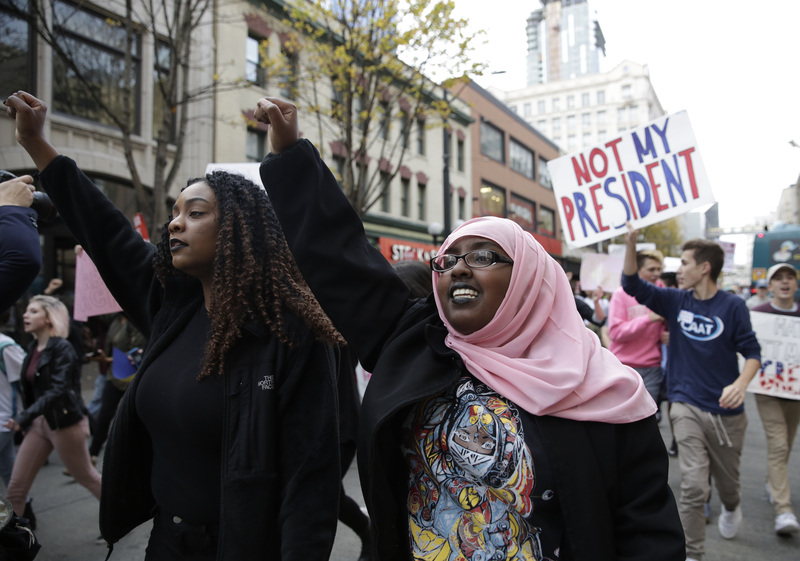 Civil rights and justice organizations have had their hands full since the election, as the reported number of hate crimes have spiked in that time. Now, a new report from the Southern Poverty Law Center is shedding some light not only on the number of post-election hate crimes that have occurred, but also on the motivations behind them. On Nov. 29, the civil rights advocacy organization released "Ten Days After: Harassment and Intimidation in the Aftermath of the Election," a report on post-election hate incidents that occurred from Nov. 9 to Nov. 18. The publication relied on media accounts and reports submitted directly to their #ReportHate page for its data. Instances of online harassment were not included. The incidents recounted in the report are arresting and heartbreaking. And though the number of reported hate incidents has gone down since it reached a 10-day total of 202 on Nov. 9, it still remains to be seen how and if a Trump presidency will affect future numbers. Here are the five states with the highest number of hate incidents, according to the report. Massachusetts comes in fifth, with 42 reported hate incidents. Though relatively small, the state is home to 10 SPLC-recognized hate groups, including Framingham's Concerned Citizens and Friends of Illegal Immigration Law Enforcement. In response to the spike in post-election hate crimes, Attorney General Maura Healey launched a statewide hate crime hotline on Nov. 14. In its first four days, the line fielded 300 calls. The Pacific Northwest and white nationalist groups have a rich history. Oregon comes in at number 10 on the SPLC's list, but Washington, one of the homes of hate group Northwest Front, cracks the top five, with 48 incidents. Despite the state's being high on the list, not everyone agrees that Washington has an election-related hate crime problem. According to The Stranger, Seattle police detective Beth Wareing, in a Reddit AMA, denied there has been an uptick in hate crimes since Nov. 8, instead pointing to "heightened awareness of these issues in the community right now." Nevertheless, the day after the election, Seattle Mayor Ed Murray ensured the city would remain a sanctuary city under Trump, even at the risk of losing federal funding. Though Texas comes in third on this list, it is first when it comes to number of hate groups documented by the SPLC, at 84. The SPLC report calls particular attention to anti-LGBT hate incidents in Texas, the only red state in the top five. Nonprofit news organization The Texas Observer launched its own "hate watch," tracking hate crimes in Texas. Currently, they've documented 22 election-related incidents. Governor Greg Abbott has not publicly condemned any racist, antisemitic, xenophobic, or homophobic post-election hate crimes. However, in the days since the election, he has spoken out against sanctuary cities and campuses, threatening to cut their funding, and is planning to sign a bill into law that would make attacks against law enforcement officers a hate crime. New York, a blue state, comes in second on the list, with 69 reported hate incidents. One in particular made headlines across the country. Brooklyn's Adam Yauch Park, named for the beloved member of the Beastie Boys who died of cancer in 2012, was vandalized with antisemitic pro-Trump graffiti. In response, over 100 people gathered for an anti-hate rally on Nov. 20. New York's high number of hate incidents hasn't escaped the attention of state officials. Governor Andrew Cuomo both launched a bias and discrimination reporting hotline and created a hate crime investigation and response police unit in the days following the election. The top three states on this list are also the nation's most populous. So it may come as no surprise that California, which is home to over 39 million people, tops the SPLC's list, with 99 reported hate incidents. All 55 electoral votes from the traditionally blue state went to Clinton, who won by a 28.8-percent margin. In addition to having the most people, California is one of the most diverse states in the country. However, it is also home to several SPLC-recognized hate groups, such as the American Nazi Party, the National Socialist Movement, and the Western Hammerskins, amongst others. The SPLC hate crimes report lists several examples of post-election hate incidents taking place in California. And state and city officials are taking notice. After the election, San Francisco District Attorney George Gascon launched a hate crime report hotline in the hopes of getting a better picture of incidences of hate crimes across the city. Though their report only covers the ten days following the election, the SPLC is continuing to monitor hate incidents across the county. Learn more about organizations to support under Trump, including the SPLC, here.